Novanta’s style incorporates many elements ranging from instrumental post-rock, where clanging guitars build up for moments on end, to shoe-gazing, where droning indiscernible vocals slide in amongst the many layers of instrumentals. There seems to be a clear element of fusion of a number of genres on their latest album ‘Crescendo’, though they’ve all been utilized in a way that produces an album that is clear sounding and concise. Each track seems to fit well in the overall album itself, making it a fairly impressive album from what is, I assume, a fairly unknown band. On ‘Crescendo’, the album’s title offers some sort of clue to the music held within. The crescendos aren’t specific to the songs themselves though, but instead to the album, which seems to build up and up, until the roaring second half of the album explodes onto the scene. There’s some wonderful instrumentals at work here, all of which creates incredibly interesting and ultimately listenable music. What is satisfying, is how Novanta haven’t allowed themselves to be trapped by the post-rock genre, and simply produce an album where there’s a number of interesting songs that sadly all sound the same. Instead, Novanta take liberties in presenting different styles and genres, producing a much more diverse and interesting album that the common norm. Novanta certainly have a lot of talent, and that much is evident on ‘Crescendo’. Although I do like the use of a number of different genres, it does make me question whether or not Novanta have a clear perspective of what they want to achieve musically. Each song seems to work well on the album, with there being a good enough flow to stop anything sounding too jarring, but at the same time, it makes me wonder whether Novanta have any real idea of what they want to do with their music, whether they have a genre they know they’re good at, or whether they’re simply producing whatever they like. It must also be said that ‘Crescendo’s album cover is perhaps one of the more poorer ones see in recent times. 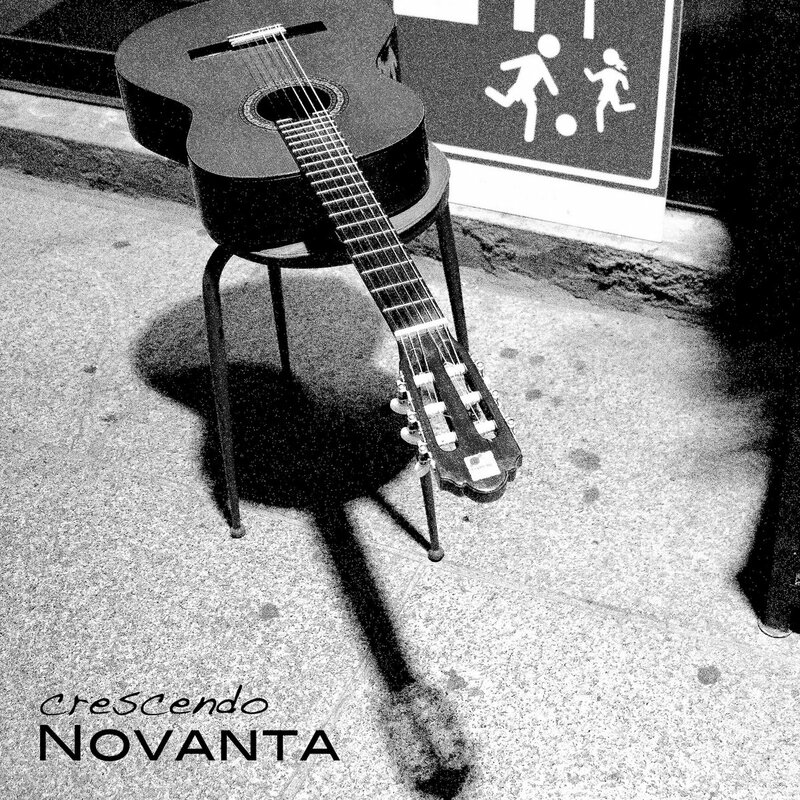 The grey-scale photo of an acoustic guitar implies to some degree that ‘Crescendo’ is simply an acoustic album, featuring singer-songwriter orientated songs. It’s misleading to a point, and perhaps Novanta should opt for more suitable album covers that suit the direction of the album’s music. Overall though, I find that Novanta’s music speaks for itself at most times, and that ‘Crescendo’ is a fairly strong album. Although some elements of the band’s direction and choices seem to weaken some of the impact of the album, it still remains an album of very strong material. It could be argued that some genres that the band use are stronger than others (I’d argue personally that the post-rock elements far outweigh the shoe-gazing elements). However, each element still seems to come together, presenting great amounts of talents and strength.